Saying that I love nail art already comes naturally to me whenever I am asked to describe myself. And when I started this nail art blog to share my passion, I didn't really expect anything else aside from my goal to inspire fellow nail art enthusiasts. But the recognition and appreciation I have been receiving for my work has been overwhelming. I know that I have all of you to thank for all the wonderful opportunities that have come to me as a nail artist/blogger. Let me thank you again as I tell you that yours truly has been featured in the Italian nail magazine, Love Nails for the July/August issue! The article appears on its Nails Community section wherein they feature a nail art blogger whose work surprised them. The collaboration began a few months ago when Love Nails editor invited me to be their distinguished nail artist for the magazine's summer issue. How can I say no to this? 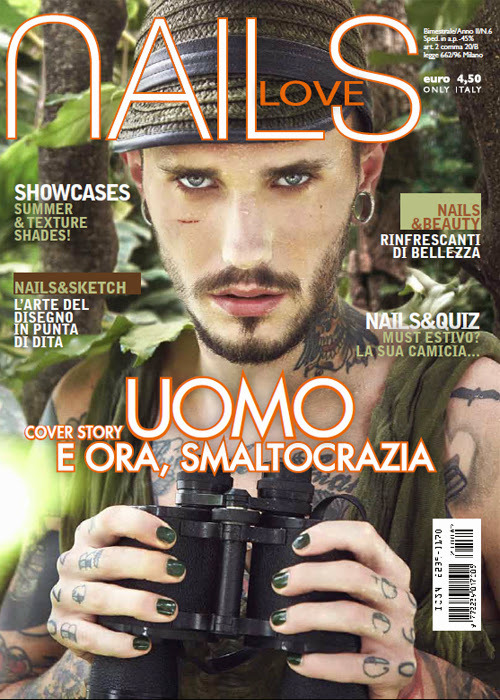 A Filipina nail artist gets a spread in an esteemed nail magazine in Italy! This is another big chance for me to be able to inspire more people and hopefully elevate nail art impressions here in my country. Love nails sent me a few questions to answer and I very much appreciated that it was all lifted from the archives. I hope all collaborations are like this, that the company takes time to really know the blogger. It is rather disappointing to be contacted by someone for a project and they ask questions that they can simply read on the blog's pages. 1. We were very surprised not only by your neat and pretty technique but also by the focus you gave to issues that are seen as obstacles by nail art beginners. Your tutorial on How to paint with your non-dominant hand is stunning! Which other topics are seen as difficulties in your opinion? Thank you. I always aspire to be as neat as possible on all my nail art creations. Inspiring nail art beginners is one of the things that motivates me to blog about nail art. I understand the disappointments of learning the craft and that is why I’d like to encourage them not to quit by sharing my own experiences and give personal tips on how to overcome the frustrations. • Finding the nail art tools that works for you. Having the skill is sometimes not enough. If the nail art brushes and paints that you use are not personally manageable, then you will have a hard time. Experiment with different tools until you find that set that will work for you. What works for others may not always fit for you. • Finding inspiration. Looking for an idea for a nail design is probably the most common problem even for professional nail artists. Inspiration is everywhere. Sometimes, it helps to just relax and let an idea come to you. A few good sources are gift wrappers, patterns, and fashion trends. • The need to impress others by coming up with an intricate nail art designs. I often mention in my blog that simple designs can be beautiful. Nail art is a learning process. We need to start with ABC before we proceed to forming words. 2. In 2011, your blog was awarded at the PBA (Philippines Blog Awards) as Luzon Best Beauty and Fashion Blog. Your future hope while accepting the deserved reward was to stop the odd faces that come upon people that do not understand your passion. Which are the most common prejudices about nail art and why do they exist? Any clue on how to stop them? Based on my personal encounters, there are people who frown upon polished nails, more so with nail art because they find it unnecessary, a waste of time, and not classy. Some say that nail art looks untidy. And perhaps the saddest prejudice about nail art I’ve heard is that it defines your social class because it is tacky and unsophisticated. I think these prejudices exist because some people cannot understand why we love nail art and particularly because they have a wrong impression of it. I’ve met people who only associate nail art to having long artificial nails with embellishments. Although it is a form of nail art, it is not solely that. There are other forms of this craft that is more subtle and in fact wearable. I also believe that how nail art is done can be attributed to existing nail art prejudices. Before, I use to frequent nail salons to have my nails done professionally. Sadly, most nail technicians here in the country do not even know how to properly clean and apply polish. As a result, manicures do not last long. And since nail art costs more and is time consuming, clients would rather not avail it since it wouldn’t last anyway. We also lack professional nail artists that can create neat and beautiful results. If people can actually see nail designs that are tasteful and done almost spotless, then perhaps they would have a change of heart. Experiencing it personally is also a way to accept nail art. Some followers of my blog have shared stories with me that receiving compliments on nail designs they wear have made them a fan of this art. Personally, a clean look is a also a way to help stop prejudices about nail art. A good design is only as good as how it is executed. Nail art is a personal preference. What is acceptable to one person may not be acceptable to another. The important thing is to respect each other’s choices. 3. We noticed your works are very miscellaneous and you don’t seem to have a particular best pattern or subject. How would you describe your style and how did you manage to achieve it and how do you translate your inspiration in nail art? I love to draw. I was a cartoonist before I made my nails as canvass or as an alternative outlet to express myself. My personal style as an artist has always been neat lines and I like details. I always try to achieve these on all my nail designs. I have also embraced freehand or the hand-painted method. I find this technique the most effective in expressing myself. Lately, I have been getting inspiration from simple patterns and shapes. I find them very versatile however you wear your nails. When I get an idea, I would draw them first on a piece of paper just to help me visualize how I would paint it on my nails. This process helps me a lot. 4. Update us about the nails mania in Philippines. What nail look is particularly fashion in this period and do your local celebrities follow the nail trend? Nail art is not yet widely accepted here in the Philippines. There are hardly any celebrities here that wears nail art. Perhaps because we only have a few professional nail artists and nail salons hardly provide a good array of classy or tasteful designs. Those who do nail art themselves here resort to the stamping technique because it seems to be the most manageable to do. Hopefully, I can encourage them to try freehand through my nail art creations. 5. In the Philippines, are there some trade publications like our magazine Love Nails? If the answer is yes, which contents do they focus on? Sadly, there are no publications here that exclusively focus on nails. But sometimes, there are local fashion magazines that features nail art in random editions. My attempts to encourage some publications to have a regular column on nails have failed. It remains to be a personal dream. 6. Suggest to our readers a local hot nail bar and some of the mate nail art blogs you follow! To Love Nails, thank you very much for this recognition. I am deeply honored. To all my readers, thank you very much for all the support. I know that all the blessings this blog has been receiving is mostly because of you. I hope to continue inspiring you with the thing I love most to do -- nail art. Congratulations! We share the same dream of having a nail art magazine here in the Philippines. I know you can help make it a reality. Hihi.